It is my great pleasure to be here this evening on this truly special occasion. I am particularly pleased to welcome you all here tonight. Looking around, I see many friends of Afghanistan, including senior UN officials, and representatives of many partner countries, organizations and agencies that have provided a vital contribution to Afghanistan’s stability and security over the years. We have gathered here to celebrate the 70th Anniversary of Afghanistan’s membership at the United Nations. The fact that we were among the initial members of the UN is a great source of pride for us, embedded in our nation’s proud history. Since joining the organization, we have stood firmly committed to advancing the core values and principles of the UN Charter: respect for the sovereignty and territorial integrity of States; solidarity; co-existence; and the advancement of an international system, based on peace, justice, multilateralism and cooperation between States. Tonight’s event is also a celebration of Afghanistan’s partnership with the UN. From a historical context, the UN has stood in solidarity and support beside the people of Afghanistan, even in the most difficult stages of our modern history. 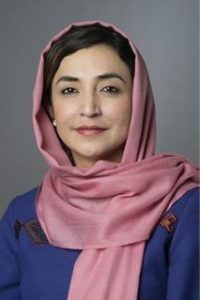 With the fall of the Taliban regime in 2001, the UN has played a crucial role in helping us open a new chapter in our country’s history, starting with the convening of the international Bonn Conference, which set the stage for the re-engagement of the international community in Afghanistan. 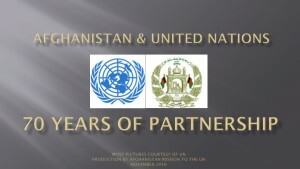 Over these past fifteen years, the partnership between Afghanistan and the UN has evolved and peaked to new heights. Moreover, the organization has been a rallying point, bringing together countries from near and far in support of Afghanistan. As the National Unity Government seeks to build on the gains of the past and improve security, economic and social conditions for our people, we are grateful for the UN’s assistance and look forward to its continued support in our ongoing quest for stability and prosperity. On this occasion, I would like to express my deepest appreciation to Secretary General Ban-Ki Moon and his dedicated team for their commitment and support for our stabilization efforts during the past ten years. We are honored by his presence here moments ago and thank him for taking the time to attend, despite his busy schedule. We also thank Secretary General-elect Mr. Antonio Guterres, who sent us his congratulatory message on this occasion as he was unable to attend due to travel outside New York. We look forward to working closely with the new Secretary General over the coming years. 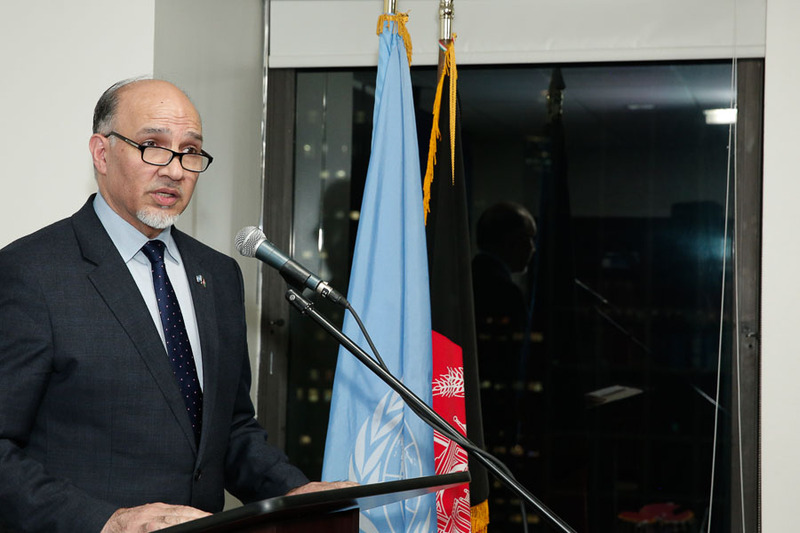 In the context of Afghanistan’s role here at the UN, we have made a concerted effort to elevate our constructive and proactive engagement on the many issues on the agenda of the United Nations. We have done so knowing that achieving a more peaceful world order in which security, justice and human rights prevails for all of humanity demands responsibility from all Member States. It is on that very basis that Afghanistan presented its candidacy to the Human Rights Council (HRC) for the period 2018-2020. In that respect, I take this opportunity to solicit the support of all our friends and partners, and the broader international community for our candidacy. Our Ambassador to Geneva, Mrs. Soraya Dalil, who previously served as a successful Minister of Public Health, is here with us tonight and she will highlight some of Afghanistan’s key achievements and policy objectives in the area of human rights. For all of Afghanistan’s achievements over the past fifteen years, terrorism currently remains the dominant challenge facing our people and future stability. Early this morning, terrorists attacked a mosque in Kabul, killing over thirty civilians, including women and children, while leaving many more wounded. It was a latest attempt by the enemies of peace in Afghanistan to stoke sectarian division. That said, I can state with full confidence that such barbaric acts will never undermine our people’s unity. Afghanistan has been in the forefront of the global fight against international terrorism. We stand as committed as ever to play our role in defeating this menace, in a holistic and effective manner. We applaud the UN’s central role in facilitating global counter-terrorism efforts, as manifested by the UN Global Counter-Terrorism Strategy. That said, we believe there is ample room for increased measures on the part of member-states to implement the Strategy. To that end, we are of the conviction that renewed efforts at the “debate, operational and implementation levels” will have much merit. In that effort, we should seek to address situations whereby terrorism and violence are used by elements within state structures to advance political objectives. Moreover, the existing counter-terrorism architecture could be strengthened by refining or adopting new resolutions focused on the drivers of such policies. And finally, we believe it is imperative that renewed focus is given to enforce relevant Security Council sanctions-regime resolutions. I take this opportunity to reaffirm Afghanistan’s long-standing commitment to advancing the global fight against terrorism. I will conclude my remarks by reaffirming our solemn commitment to the goals and principles of the UN Charter. The UN has come a long way during the past 70 years in working to promote global peace, security and prosperity. I can assure you all that achieving the vision set out in the UN Charter will remain a corner stone of Afghanistan’s foreign policy.